It's fair to say you'll be surprised when you take the cat for a spaying only to discover your vet can't spay her because she's expecting. The surgery that would have prevented her pregnancy will have to wait. You won’t be able to get her spayed right away after her litter is born. She’ll be ready several weeks after delivery. After Mitsy gives birth to her tiny fur balls, she’ll be nursing them around the clock for weeks. You shouldn’t get her fixed during this time frame; the surgery can be more complicated. When mama kitty is in the nursing stage, her mammary glands are swollen during milk production, making surgery undesirable for most veterinarians. Wait until the kittens start weaning before getting Mitsy spayed. You’ll be able to start weaning your fluffy pals around 4 weeks of age, the ASPCA says. During this period, you can separate the kitties from their mama for a few hours at a time. Feed them gruel, kitten food heavily soaked in water or kitten milk replacer, for four to six weeks -- between about ages 4 weeks and 10 weeks -- until they are no longer nursing. This weaning stage is the soonest you should spay Mitsy after she gives birth. She can still produce milk for her babies when they need it, but they’ll be content being away from her for periods of time as they learn to eat and take care of themselves. Spaying Mitsy shortly after delivery is essential if you have a non-neutered male cat in the home or if she is free to roam outside and mate with the town tomcat. She’s fertile again soon after her kittens come into the world -- weeks before she begins weaning. Since you have about a month to wait before you can spay her, you must keep her separated from intact male kitties. Otherwise you could wind up with another litter of kittens a few months later. 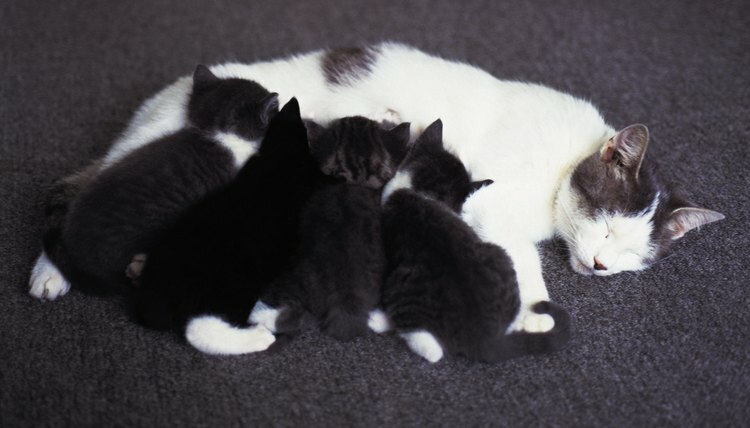 If your vet gives you the go-ahead to have your mama cat spayed during the weaning era, you’ll need to step in and help take care of her infants. Watch each fur ball during feeding to ensure they are all eating and drinking. They’re still learning to eat on their own and might need a bottle once in a while until Mitsy is well enough to nurse again, if she needs to nurse at all. Usually somewhere around 5 weeks to 6 weeks of age, kittens should be perfectly happy eating simply moistened food, reports the ASPCA.